Use the Copy Class Session function (Classes menu > Copy Classes) as the second step in transitioning between sessions. It will assist you in setting up a new session by copying multiple classes from one session into another. If any of the classes you want to copy have been archived, you will first need to restore them before you are able to have them included in the copy classes function. In the Search Criteria section, select the classes that you want to have copied into your new session. The Session drop-down is required, however, it is optional to copy classes from only a specific Category 1, 2, or 3. You may also choose to copy a specific class or classes. In the New Class Settings section, you will define the settings for the new classes that are being created. Select the new session from the drop-down (required). 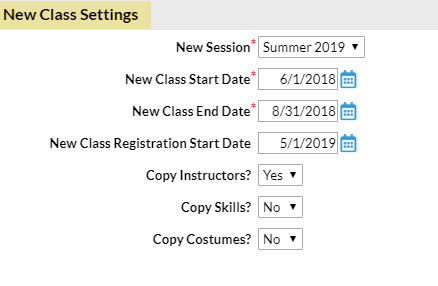 The New Class Start Date, New Class End Date, and New Class Registration Start Date fields are automatically populated with the dates used to create the session (Tools > Edit Settings > Drop-down Lists > Session), however, they can be edited if you choose. The start and end dates are required fields. Indicate whether you want to copy the instructors, skills, or costumes from the original classes into the new classes. In the Option: Copy Enrollment? section indicate whether or not you want to copy student enrollment. If opting to copy enrollment, select an Enroll Type for the new class enrollment. Indicate whether you want to copy any future enrollments or waitlisted students from the old classes into the new classes. Select an Enroll Date for new class enrollment (will default to current date). When a future date is used, you will see a warning that you are not able to post tuition fees until that date because, until then, the students are not enrolled in the new classes. Any makeups that were scheduled in the old classes are NOT copied forward. Option: Drop Students From Old Classes? In the Option: Drop Students From Old Classes? section set Drop Students from old class? to Yes to drop the students from the current class immediately. This option only drops the students from the classes, it does not archive the classes which is the last step when transitioning between sessions. You should only opt to drop students after all class fees have been posted. Consider using Archive Classes instead (which will also drop the current enrollment) at a later time after you have completed your fee posting.